Another wonderful day ahead of us in Lourdes. This will be the first time I've been here for a Saturday, so it will be interesting to see if there is any difference in the way the Domaine "feels." We're starting with Mass in the Grotto itself at 8:30am. There will be a video on the life of St. Bernadette shown at the Forum Information at 9:30am, and then, in recognition of the fact that we have to leave Lourdes very early on Sunday, there is pretty much a free day, until the first Sunday Mass at 4pm, which we're celebrating in the Chapelle Saint Michel again. Then more free time until dinner and the torchlight procession. A pretty gentle day ahead of us. We will start off with Mass in the Chapelle Saint Michel, which is to the right of the Crypt Chapel. It's the twin chapel to that of St. Gabriel, but the road runs right past that one, which means that it is very noisy, and tourists and pilgrims are more likely to try to wander in for a look round... which isn't really ideal, as the door is right next to the altar! The Chapelle Saint Michel is on the side above the Grotto and the Gave river, and there is a gate which is often locked, so people don't often try to go through. I took this photo last year, from just outside the chapel door, looking down. 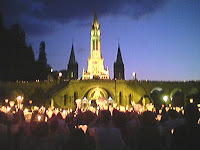 The group of people at the bottom of the picture are attending Mass at the Grotto, and further back you can see the candle stands and the baths. Then, after Mass, we'll have our official group photo taken in front of the Rosary Basilica. There's free time until the Stations of the Cross at 4pm. We'll have two groups - the more agile pilgrims will make the traditional stations on the Espélugues Hill. They are the most beautiful stations, but the hill is very steep, and the pathway rather treacherous underfoot, especially if there has been any rain. It's deceptively easy on the way up, though steep. But, the last time I went, I had to hold on to a friend's arm on the way down at the end, and I realised that it really wasn't a good idea to repeat the experience. The second group will make the Stations over on the other side of the Gave. These stations have been updated in time for the Jubilee celebrations, and I'm very keen to try and get a few photos. Once again, we'll finish the day with the torchlight procession at 9pm. The third day of our pilgrimage, and the "dreaded dunking" is scheduled! Actually, this is something I wouldn't want to miss. Until last year, I went to the baths every day during my stay in Lourdes. Then it was pointed out to me, by one of the helpers who'd noticed my frequent visits, that by going more than once, I might actually be depriving someone else of the opportunity. The queue, on the women's side, is certainly ferocious, and, regretfully, I decided to limit myself to a single visit in future... unless I'm visiting out of season, and there is no sign of a queue! 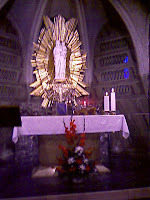 Mass today is in the Crypt Chapel (the High Altar is shown in the photo above, taken on pilgrimage last year) - and it's the only part of the church which was built while St. Bernadette was still in Lourdes. Later, we'll pray the rosary at the Grotto and have the blessing of children - this will be the first time I've attended this particular service, and the first time it's been scheduled in to our official programme. Then there will be the Blessed Sacrament procession, starting at 5pm, and we'll finish our day with the 9pm torchlight procession. 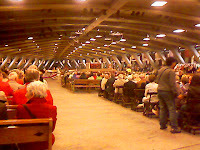 Mass In The Underground "Car Park" ! Our first full day in Lourdes will start with Mass in the Basilica of St. Pius X... the one I refer to as the "underground car-park." I'm afraid that pre-stressed concrete pillars are just not my thing. Still, the shrine authorities have tried to pretty it up a little by hanging up banners of the most recently canonised saints, along with some older favourites. I just don't understand why someone doesn't give the place a lick or two of paint... just to brighten it up a bit! 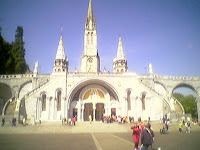 The Basilica seats 10,000 pilgrims, and the International Mass is something to be experienced. It is better than it used to be, apparently, as there is more Latin, so there is less need to have prayers in every single different language. Overhead screens also provide translations of some bits... as well as the words for the hymns... karaoke style! The Mass starts at 9:30am, but if you want a seat you need to get there considerably earlier. At 3pm we have our tour of the town. The "Way of the Jubilee" visits the places mentioned by Pope Benedict in the indulgence he granted for this 150th year: places like the Cachot (the condemned prison where the Soubirous family were living at the time of the apparitions) and the parish church. 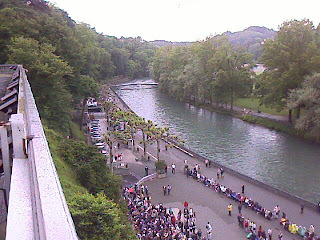 I missed out this walk for the last couple of years, having been to the places on several occasions previously, in an attempt to pace myself... Lourdes is very hilly. However, if my knee and ankle aren't playing up too much after yesterday's travelling, I hope to make the effort to go along today. The torchlight procession at 9pm will finish off our day perfectly! The big day has finally arrived. Because of flight times and the coach journey, it won't be possible to have Mass when we arrive in Lourdes, so we will start off at 8:30am with a Low Mass in the parish before we leave. Then, after a cup of tea, we'll have a special pilgrimage blessing before boarding the coach to Gatwick. In theory, we should have our own dedicated check-in, courtesy of British Airways. At least, that's what I was promised. If we do, I shall be sure to take a photo, because it'll be a first for me! We arrive (Deo voluntas) in Toulouse at 4:15pm, and in Lourdes at about 6:45pm (travelling by coach from the airport), which means that we should arrive just in time for dinner at the hotel, and we'll have time to find our rooms and unpack before going to pray the rosary on the torchlight procession at 9pm. Then, those of us who are still conscious will be able to relax in the hotel bar. I am going to be cheating dreadfully this week. I am making use of Blogger's new scheduling facility, as I'm not sure that I'll be able to get access to a computer - though I'm certain that His Hermeneuticalness will manage it somehow. Anyway, rather than put up a huge post with what we've got planned for the whole week, I'm doing a day-by-day schedule, which will (hopefully) go up each morning. I can add more posts if I do manage to prise Fr. Tim away from the computer in the nearest internet cafe, but there will be a little something for you all in the meantime. 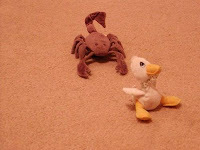 And when I get back, there will be a photo-fest, and maybe even a video, so watch this space! After the awful tragedy of Noisykid number three's death, a little light gleams. A new noisykid is in the process of making its presence felt. Heartfelt congratulations and many prayers to Dadwithnoisykids, Wifeofdadwithnoisykids, and the Noisykids themselves. 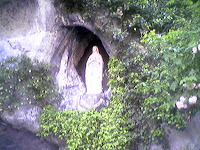 I shall pray for you all at the Grotto in Lourdes. "I would like to personally thank all those Members of Parliament who tabled amendments and voted in defence of unborn human life. 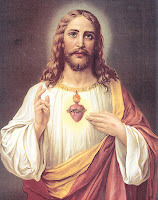 I call on all people of faith – Muslim, Jew, Hindu, Buddhist, Sikh, and Christian – who believe in the sanctity of unborn human life to join with the Catholic Church in redoubling their efforts in the continuing campaign for a change in these laws. "During the 19th century, slavers said black people weren’t human. They were wrong. During the 20th century, the Nazis said Jews weren’t human. They were wrong. Since 1967, the House of Commons has said the unborn are not human. They, too, are wrong." Twitch of the mantilla to Fr. Ray Blake and John Smeaton, both of whom carry the full text of the Bishop's statement. On a related note, did anyone else pick up on the fact that, when the Dalai Lama appeared before MPs this week, he was addressed as "Your Holiness," while, when Bishop O'Donoghue attended the Select Committee, it was considered ok to use first names?